The Seahawks receiver had a lot to say Thursday about the continued controversy over the NFL's stance on the national anthem. 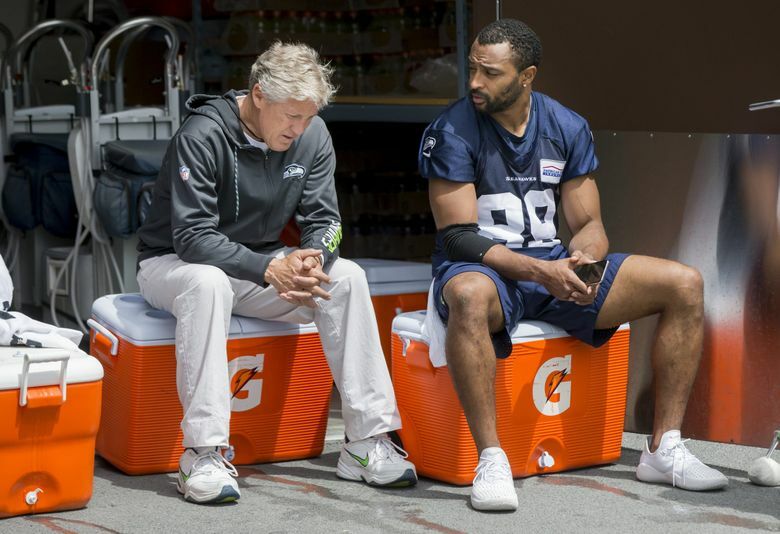 A few days ago, Seahawks receiver Doug Baldwin was hoping he wouldn’t be in a position anytime soon to be asked a question about the national anthem and a statement by president Donald Trump that would result in a headline-making comment. Baldwin, like many of his NFL-playing counterparts, thought the issue of players making protests during the anthem was receding and the focus turning to the league acting in concert with players to address their concerns that led to the protests in the first place. He was ready, in other words, to stick to football for a while, at least when it came to anything happening on the field. Seahawks receiver Doug Baldwin comments on Donald Trump’s comments about the national anthem Thursday. But then the NFL announced a new policy on Wednesday requiring all players to stand for the anthem and act in a respectful manner if they are on the field, essentially mandating that any protests happen behind closed doors, with teams potentially being fined if players didn’t comply. That was followed Thursday by a comment from Trump in an interview on Fox News that “maybe you shouldn’t be in the country” if you don’t stand for the anthem. And that led to Baldwin being asked about Trump’s comment following the team’s Organized Team Activity workout. But that was hardly all Baldwin — who now is one of the team’s most senior members having entered the NFL in 2011 and has long been one of its most active players in the community — had to say. Baldwin said the NFL’s new policy only revived the issue and agreed that some players who maybe had moved on from protesting in any manner might now consider again taking a stance. Both Baldwin and quarterback Russell Wilson said they agreed that the NFL’s stance was tantamount to telling the players to shut up. Both Baldwin and Wilson also said that the continued attention on the protests themselves takes away from what the players were protesting for — attempting to find ways to solve issues such as discrimination, misconduct by police and generally helping communities. Seahawks coach Pete Carroll agreed with the overall sentiment expressed by Wilson and Baldwin that he felt the teams and players “were in the process of figuring this out and how to put it together,’’ — essentially hinting that there wouldn’t have been protests this season. Now, Carroll said, it’s an issue the team will again have to work through. Carroll said it was too soon to know how the team might react but that whatever the team does it will do together. Carroll said the Seahawks would continue to support their players in any way they can. And while Baldwin said he didn’t know what kinds of actions players may take next season he said to expect something to happen.